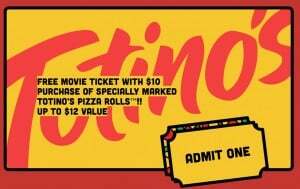 It you spend $10 on more on Totinos food products, you can get a FREE movie ticket! All Totino items must be made in ONE purchase. To get your movie ticket, take a photo of your receipt and email or text it to the company. Be sure to follow the directions to get your freebie! If you need to know what items qualify, check out the list here. This offer expires on March 31!